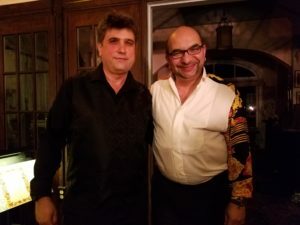 On the evening of Saturday, August 25th at the Marcella Sembrich Museum in Bolton Landing on the shimmering banks of Lake George, we happily witnessed a program called “A Night in Budapest.” It featured Daniel Szasz, violinist and Laci Rácz on the cimbalom. The two other musicians were József Szász, viola and Lőrinc Szász on double bass. Earlier that evening, we joined the music lovers outdoors midst the high pine trees along side Lake George for Hungarian refreshments and lively talk. We then entered the concert room of the Marcella Sembrich (1858-1935) Museum where the great Polish soprano lived and had her school of vocal students from Julliard and the Curtis Institute from 1924 until her death in 1935. The room had portraits and paintings of Mme. Sembrich and a view of the lake in the front of the room. Over a decade ago in Eastern Transylvania’s largest city, Daniel Szasz and Laci Rácz joined forces to create the Üsztürü Ensemble. The group has won raves in both Europe and North America. It brings to life a “revival” of the old school of authentic village musicians playing Hungarian music. Daniel Szasz, master violinist is concertmaster for the Alabama Symphony and is concertmaster of the Lake Placid Sinfonietta and has been praised for his “breathtaking” and “exquisite” playing to which I add, a Hungarian with the style of Paganini! Laci Rácz is an 8th generation descendant of the legendary Rácz family of musicians playing both violin and piano. 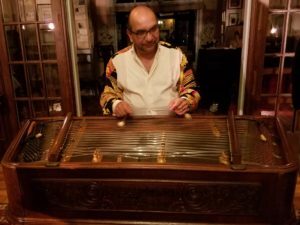 He was drawn to the cimbalom and played in many orchestras including the Hundred Gypsy Violin Orchestra and gypsy bands as well as the famed Roby Lakatos Ensemble in Brussels. His studies at the Béla Bartók Conservatory and the Franz Liszt Academy helped him perfect his art. Richard Wargo, composer and Artistic Director of the Marcella Sembrich Museum, introduced the soloists and ensemble and gave a brief history of the museum and mention of this great soprano Marcella Sembrich. She sang at the Metropolitan Opera the night after it opened in 1883 and later on, including her Gilda to the Duke of Mantua who was the legendary tenor Enrico Caruso in his Met debut in 1903. 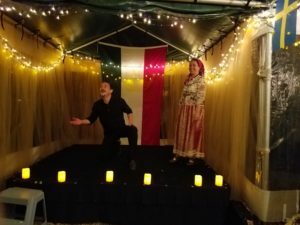 Enrico Caruso was the subject of last year’s gala at the Sembrich in another brilliant late summer affair. Mme. Sembrich brought her much acclaimed Gilda (Rigoletto) to the Brooklyn Academy of Music with the Metropolitan Opera on tour on November 23, 1908 with fellow Pole, acclaimed basso Adamo Didur as Sparafucile under the legendary baton of Arturo Toscanini. Fortunately, her Caro Nome and the Rigoletto Quartet (with Caruso) are part of her recorded legacy. Her recordings are available at the Sembrich Museum. 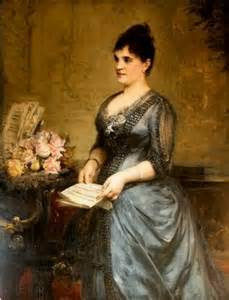 Her Lucia Sextet with Caruso and The Merry Widow Waltz (Both recorded in 1908) are really worth a listen – such brilliant coloratura and embellishments. 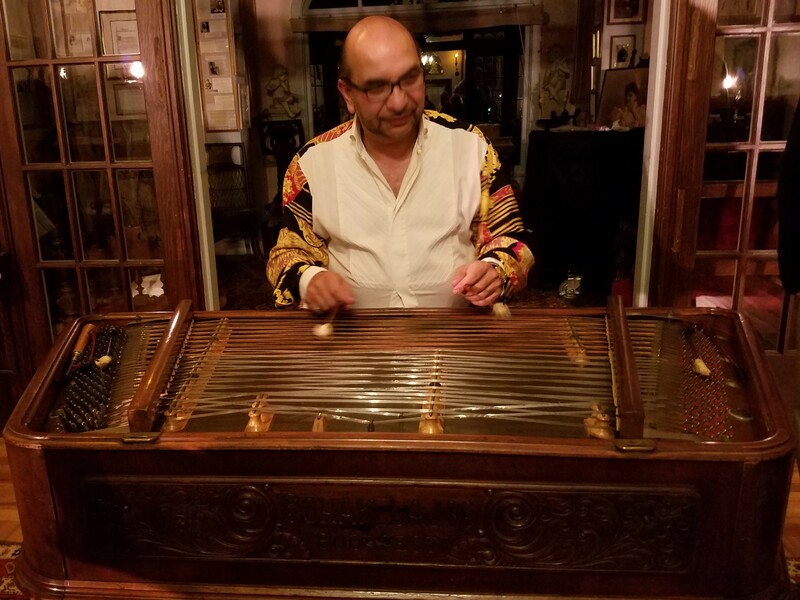 Laci Rácz gave us a brief history of the cimbalom which originated in Persia 600 years ago and his instrument looked like an exotic desk with strands of steel keys that were plummeted by mallots much like a drummer but the soft exotic tones were from another world. The great Hungarian American radio announcer, George Jellinek use to open his program “The Vocal Scene” with a Zoltán Kodály piece, Háry János Suite, which had a cimbalom playing. As a young man, I often wondered what instrument that wonderful sound was from. The program began with Este a Szekelyeknel (An evening with the villagers) by Bela Bartók. Daniel Szasz played masterfully, the violin had power and precision and the art of seemingly calling the shots, while the cimbalom, in the soul and hands of Laci Rácz, seemingly in agreement, yielding and shining. The second piece (Traditional) arranged by L. Rácz Citromfa (Lemon Tree) had both violin and cimbalom playing loud and soft swaying like a succulent tree being pushed by a gentle breeze. Next was Puszta Fia (Son of the Puszta) by B. Keler. 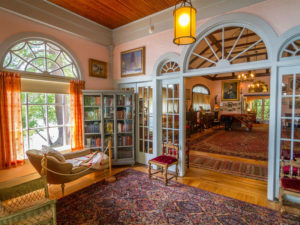 This was played by both the violin, sweeping imploring with Daniel Szasz seductive tones and the cimbalom with Laci Rácz yielding to the passionate outbursts. Both instruments and their interpreters played with magnanimity, soft and louder with abandon and panache. Valse Triste by F.Vecsey, had a touch of Finnish composer Jan Sibelius who also wrote an iconic composition with the same name. A Csitari Hegyek Alatt, arranged by L. Rácz, proved to be electric and haunting, a virtuoso ensemble with Lőrinc Szász on the double bass adding richness and József Szász fulfilling with his singing viola. A traditional piece followed, Csipd meg Bogar arranged by Laci Rácz that allowed each musician to express the joys of being Hungarian through music. 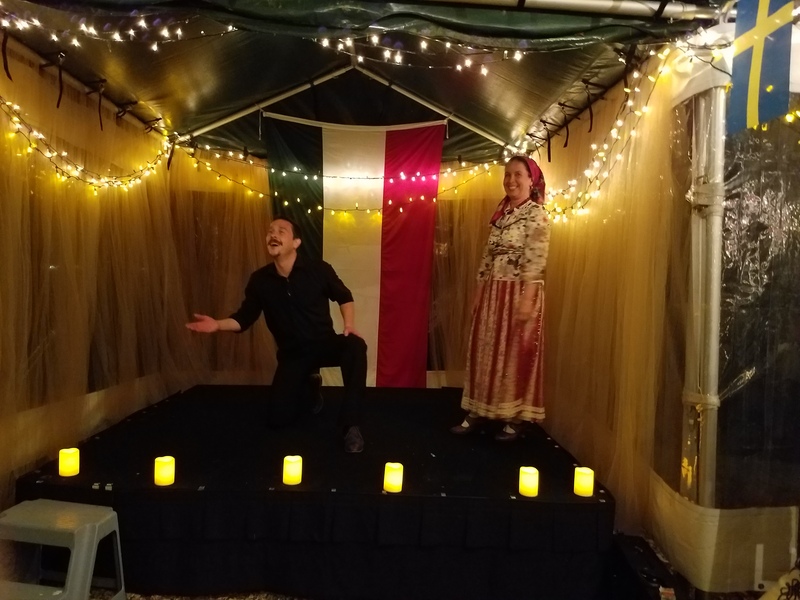 The fabulous and familiar Franz Lehar’s Magyar Abrand (Hungarian Fantasy) with its soaring melodies and extravagant grandeur, took us to the heavens and I could swear the ducks were dancing on the waters. J. Hubay with Hejre Kati (Scene de la Csarda No. 4 op. 32) had a cimbalom solo that was like drummer Gene Krupa in his prime and Enrico Caruso and Marcella Sembrich singing the Rigoletto duet and Paderewski stunning his audience on the piano. The combination of violin and cimbalom making love that made for musical climaxes that gave goosebumps and the desire to make new decibels with shouts of bravo and bravi! The Csardas from Hungarian Rhapsody No. 18 by Franz Liszt was foot stomping and bravura! If I did not have any Hungarian DNA, I got it from exposure to such thrilling samples of the soul of Hungary. The final selection, Csardas by V. Monti was the fulfilling and defining moment of this concert. Feet marching and moving to music, not military strutting about a people that fought to be free and have that beat in their heart and soul. It was brought to vivid and thrilling life at this unforgettable concert assembled by Richard Wargo and staff. 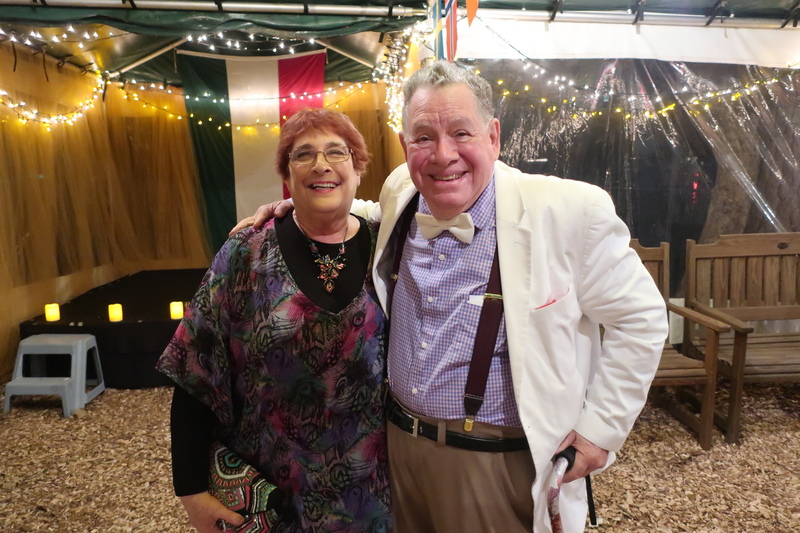 I know that the spirit of Marcella Sembrich through Richard Wargo, blessed us all with a night to always remember. Afterwards we went outside to enjoy superb desserts and libations. The Hungarian delicacies were from the exalted kitchens of the Inn on Gore Mountain with Rich, Susan, Sophia, and Chun Ling Minucci. Even though I am on a diet, a delicious sensual strudel made me an offer I could not resist. 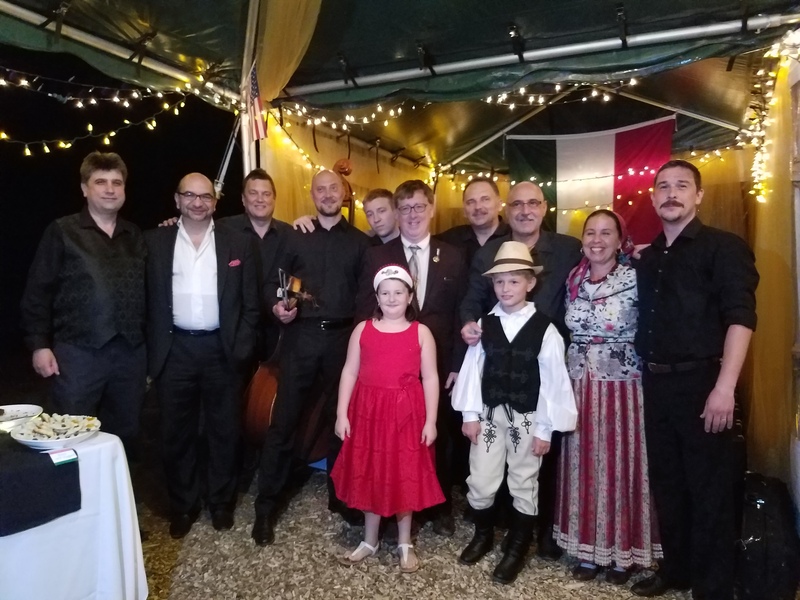 There was exciting Hungarian folk dancing with the exuberant Julia Redo and Csaba Zsolt Tokes and two charming, talented costumed youngsters, who were ushers, Annabelle and Balazs. What fun! Thank you Richard Wargo, you are a composer of note (Marni Nixon sang in one of your operas) and you looked dashing and very proud wearing a medal given to you by the Polish government for your cultural work. Thanks to Executive Director Elizabeth Barton-Navitsky and Administrative Assistant Michelle San Antonio for your many kindnesses and your assistance hosting this beautiful happening. It was nice to meet and chat with Board President Bill Post Hubert who is also a noted organist and his wife Katherine and board members Philip Kates who is a violinist with the Philadelphia Orchestra and a member of a superb chamber music group called Liebesfreud and Charles and Anita Richards also board members who reside nearby. 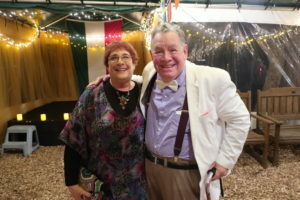 I enjoyed Charles’ “Buda-Pest” shirt that he wore with ethnic pride! It was another perfect night under the full moon and stars. Judy and I will always remember “A Night in Budapest” at the beautiful and rustic Marcella Sembrich Museum on the banks of Lake George. A glass of Tokay (or tokaj) “Sto-lat!” meaning “To your health or 100 years!” (Polish) or “Egészségére!” (Hungarian) and a toast to Autumn, the holidays and to next year at the Marcella Sembrich Museum!